WASHINGTON – The 2012 NCHV Annual Conference and Membership Meeting at the Grand Hyatt Washington was the largest in the 22-year history of the organization, and may yet prove to be one of the most important forums in the campaign to end veteran homelessness. More than 529 community-based organization and government agency representatives participated in the three-day event, which featured 38 instructional workshops and special focus sessions. Panelists from every sector of the public assistance arena addressed issues ranging from veteran housing, to employment and income security, to prevention strategies that are impacting communities across America. A comprehensive analysis of participant surveys showed an 85% overall approval rating, with a session content approval rating of close to 90% across the board. The conference was titled “Halfway Home: Progress in the Plan to End Veteran Homelessness,” and featured two members of President Obama’s Cabinet – Department of Veterans Affairs (VA) Secretary Eric Shinseki and Department of Housing and Urban Development (HUD) Secretary Shaun Donovan. Other key participants included HUD Deputy Assistant Secretary Mark Johnston; U.S. Interagency Council on Homelessness Deputy Director Anthony Love; VA National Director of Mental Health for Suicide Prevention Dr. Janet Kemp; Director of the National Center on Homelessness Among Veterans Vince Kane; Acting Director of VA’s Homeless Initiatives Office Pete Dougherty; Department of Labor’s Homeless Veterans Reintegration Program (HVRP) Competitive Grants Lead Officer Ken Fenner; and Rep. Jeff Miller (R-FL), Chairman of the U.S. House of Representatives Committee on Veterans’ Affairs. For the second consecutive year The Home Depot Foundation was the lead corporate sponsor of the NCHV Conference, and Chief Operating Officer Fred Wacker met with service providers throughout the event to discuss funding opportunities to increase access to housing for homeless and at-risk veteran families. The National Equity Fund and NewDay USA also provided funding support. One of the more celebrated interactive sessions of the conference was the meeting between the nation’s homeless veteran service providers and the VA Advisory Committee on Homeless Veterans. Committee Chairman George Basher received the “go-ahead” from VA headquarters to hold an unprecedented session at the NCHV Annual Conference to hear the concerns of community-based organizations working with the VA under the Five-Year Plan to End Veteran Homelessness. The committee, which serves under a Congressional directive, prepares an annual report for the Secretary of Veterans Affairs. The report identifies service needs of homeless veterans and makes recommendations to the secretary. Many of the recommendations the committee has advanced have had a direct impact on the service provider community. More than 60 community organization and local government representatives attended the session. NCHV recorded the discussion points raised during the meeting and is working with participating service providers to identify and rank the “points of concern,” and incorporate providers’ recommendations into a report that will be presented to VA leadership, the VA Advisory Committee, the VA Homeless Initiatives Office, and the National Center on Homelessness Among Veterans. We will distribute links to the session report to the full NCHV membership once it has been published. At the same time, NCHV is conducting a membership survey to get a better sense of customer satisfaction with federal efforts under the Five-Year Plan to End Veteran Homelessness – both on the national and local levels. “Opening Doors: Federal Strategic Plan to Prevent and End Homelessness” was officially adopted by 19 federal agencies in June 2010. That plan fully incorporated the VA’s Five-Year Plan, with the goal of ending veteran homelessness by 2015. We are now two years into the plan, with three to go. The most recent HUD Annual Homelessness Assessment Report to Congress estimated that 67,495 veterans were homeless in the point-in-time count in January 2011. The figures for January 2012 will be released soon, and there is considerable optimism the incidence of homelessness among veterans has continued to decline. It is our hope that the report of service providers to the VA at this point in the Five-Year Plan, and the NCHV members’ survey, will help foster a climate of renewed and vigorous collaboration between VA and its community partners to identify and remove obstacles to optimum service delivery, and ensure the maximum effectiveness of homeless veteran assistance programs as the Five-Year Plan moves forward. We want to send a special note of thanks to the 2012 recipients of the NCHV Congressional Leadership Awards: Rep. Jeff Miller (R-FL), Chairman of the U.S. House of Representatives Committee on Veterans’ Affairs, and Sen. Patty Murray (D-WA), Chairman of the U.S. Senate Committee on Veterans’ Affairs. Rep. Miller and Sen. Murray displayed uncommon courage and unwavering dedication to the nation’s veterans in crisis in their efforts to preserve funding for HUD-VA Supportive Housing (HUD-VASH) vouchers in FY 2011. During one of the most contentious legislative cycles in recent memory, their commitment and effective leadership helped save about 7,600 new housing vouchers for veterans with serious mental illness and other disabilities. Both the Senate and House Committees on Veterans’ Affairs stand among the most respected institutions in the Congress, a legacy built upon a proud history of bipartisan support for this nation’s military heroes regardless of their status. And we know there are many, on both sides of the aisle, who also deserve recognition for that commendable action. It has been our honor and privilege to express our personal appreciation to as many of them as possible since, and hope this message reaches the rest of those who took that stand. 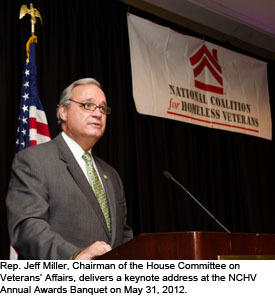 Rep. Miller was also cited at the 2012 Annual NCHV Awards Banquet for his actions to protect the Veterans Health Administration – including VA homeless assistance programs – from sequestration in FY 2013. The language in current law is contradictory on the point; one section allows up to a 2.0% reduction in health care funding. Rep. Miller successfully appealed to President Barack Obama and the Office of Management and Budget (OMB) to make a ruling on the sequestration issue, and has filed a bill in the House to remove the ambiguous language. Sen. Murray has been a longtime champion for women veterans and single veterans with dependent children. She has sponsored legislation to strengthen service programs for both, and currently has a comprehensive homeless veterans assistance bill before the Senate that would provide capital funding for established programs to provide for the safety, privacy and security of women veterans and veteran families.